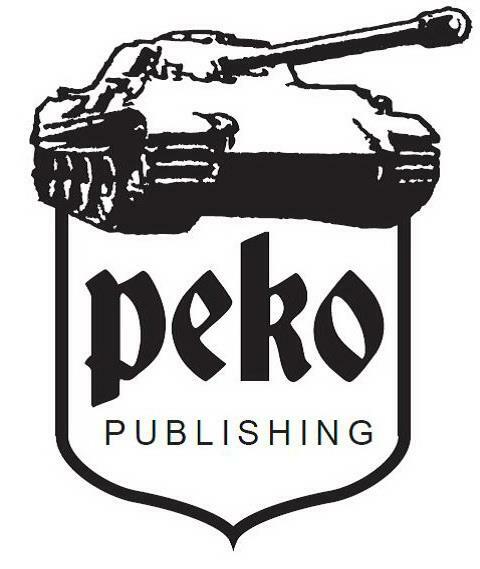 The first book from Peko - called “Sturmgeschütz III on the battlefield” was a landscape format with a black and white cover and 112 pages of dual Hungarian and English text. The pictures were in focus, of the rare or unpublished variety and the text was informative but never too much to get in the way of the photos. A good feature is the author including in the captions who made the StuG and when or what period it was made. This book on the surface has all of the same features as volume I in this series about the StuG - the same amount of pages, author and layout with one side of the text in very well translated English and the other side in Hungarian describing the large format pictures that are the stars of these books – I liked the first book and this has got me just as interested so far. But this isn’t a first look review. The photos are the real star of the show here - they are from private collections and are previously unpublished shots. Their quality is top notch and they are clear “in action” shots quite often taken from European sources – No GI’s perched on top of wrecked vehicles, these are shots of these AFV’s in action – heading into battle or being repaired – some propaganda stills and some interesting shots I couldn’t classify we will talk about later – the text to support the pictures just ads to the understanding of the scene in the frame. Often naming crew members and the towns where these were shot. We also have a credit in the top of the frame telling who supplied the shots. I got a shock then when I initially started reading the text though – the first two pages of the intro were in Hungarian! Now my Magyar isn’t that good, and I was a little worried until I remembered that there are the same pages but in English language that followed these – Bi-lingual text indeed! The intro tells a little about who made the StuG with an interesting table showing man-hours needed to make one. The tanks tracks took slightly longer to make than the optics but only half the time as constructing the engine! Also we have a breakdown of the crew functions and the variant’s use right throughout the war in the desert, forests and snowy battlefields and several sideways on a broken bridge! 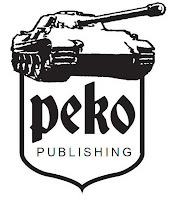 The StuG III’s in this book though are captured (mainly) on operations on the eastern front from December 1941 onwards. 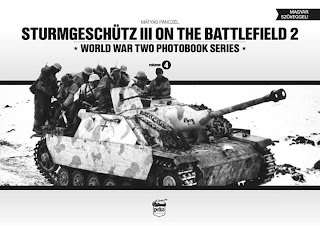 After the intro we get straight into it – twenty seven pages of full page format pictures of the short gunned StuG in action from the late days of the battle of France to the dust and then snow of the eastern front. Often we see StuG’s flying through dust or mud and travelling in convoy or through towns. A feature of this book is several shots in pairs that show different views of the same vehicles, and far from being repetitive I think this helps modellers and history buffs. The long barrelled “F” models are then featured – as far as in Norway and some interesting shots in a series of six photos showing the StuG III being used as a vehicle to ferry a dead SS man in his funeral procession. Anther thirteen pictures in this section of the book show an almost propaganda style line up of SS StuG “G’s” lined up and in action with their crews in training and on manoeuvres with very clean and undamaged examples before we return to Central Europe and Russia for more battle forged vehicles in combat conditions. Indeed these vehicles seem to get more and more beaten the further we get into the book – with good reason I suppose. There are several pictures in open plains of Russia with these StuG’s supporting Sd.Kfz.165 Hummels which make an interesting study of these two together. It is from here on we start to see more wrecked vehicles, in Germany and France as well as Italy. This book chronologically captures the StuG III’s rise and fall. This is a very solid addition and a worthy companion to the earlier book on the same subject. If you liked that then you will like this as well. Modellers will find this full of inspiration and information in equal amounts. And it’s never hard reading either. Thanks are due to Peko Publishing for this book.